Nextdoor, the social network that aims to connect people living in the same communities, has said it’s introducing a dedicated section on its website for real estate. 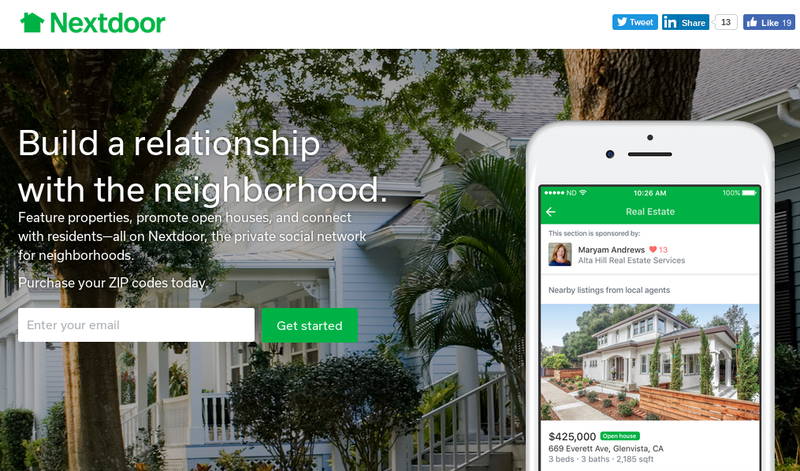 RealtorMag reported that Nextdoor will allow real estate pros to sponsor real estate sections in neighborhoods where the site operates, so they can connect more easily with prospective clients in the areas where they do business. Nextdoor said the feature is being rolled out in 10 markets at first: Atlanta; Austin, Texas; Dallas/Fort Worth; Houston; Los Angeles; Phoenix; Portland; Sacramento, Calif.; San Diego, and San Francisco. Nextdoor is unique from better known social media sites like Facebook as it creates dozens of neighborhood-specific websites that can only be accessed by people living there. This “hyperlocal” focus makes Nextdoor an attractive platform for real estate marketers, reckons Nextdoor CEO and cofounder Nirav Tolia. Nextdoor already allows real estate agents to create a kind of business page on its site, and they can do so at no cost. For an additional fee agents can link their Nextdoor page to listings and other information available on their own website, together with recommendations from other Nextdoor users. The company claims more than 22,000 real estate agents have already created pages on the site. With the new dedicated real estate section, users will be able to discuss topics such as the homes for sale in their neighborhood and property values. In addition they can also use it to connect with real estate pros who sponsor the section, in addition to those recommended by other users. The bad news is that sponsoring a real estate section doesn’t come cheap. Tolia told RealtorMag that pricing varies between $100 and $1,000 per month depending on the neighborhood. The company will only allow one real estate pro to sponsor each neighborhood to begin with, though it may auction off additional sponsorship slots at a later date. Nextdoor’s initiative comes just days after Facebook said it was bringing its Dynamic Ads capability to real estate, allowing agents and brokerages to promote listings to users who’ve previously viewed their web pages.